↑ Stableford, Brian. "Science fiction before the genre." The Cambridge Companion to Science Fiction, Eds. Edward James and Farah Mendlesohn. Cambridge: Cambridge University Press, 2003. pp. 18–19. ↑ Allen, Hervey. "Introduction". The Works of Edgar Allan Poe, New York: P. F. Collier & Son, 1927. Hoffman, Daniel (1998). Poe Poe Poe Poe Poe Poe Poe (Paperback ed.). Baton Rouge, La. : Louisiana State University Press. ISBN 0807123218. Meyers, Jeffrey (1992). Edgar Allan Poe: His Life and Legacy (Paperback ed.). New York: Cooper Square Press. ISBN 0815410387. Quinn, Arthur Hobson (1941). Edgar Allan Poe: A Critical Biography. New York: Appleton-Century-Crofts, Inc. ISBN 0801857309. Rosenheim, Shawn James (1997). The Cryptographic Imagination: Secret Writing from Edgar Poe to the Internet. Baltimore: Johns Hopkins University Press. ISBN 9780801853326. Silverman, Kenneth (1991). Edgar A. Poe: Mournful and Never-Ending Remembrance (Paperback ed.). New York: Harper Perennial. ISBN 0060923318. Sova, Dawn B. (2001). Edgar Allan Poe: A to Z (Paperback ed.). New York: Checkmark Books. ISBN 081604161X. Whalen, Terence (2001). 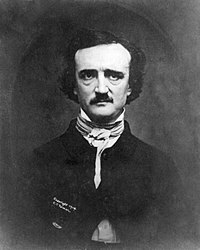 "Poe and the American Publishing Industry". In J. Kennedy. A Historical Guide to Edgar Allan Poe. Oxford Oxfordshire: Oxford University Press. ISBN 0195121503. หน้านี้แก้ไขล่าสุดเมื่อวันที่ 15 มีนาคม 2562 เวลา 19:02 น.